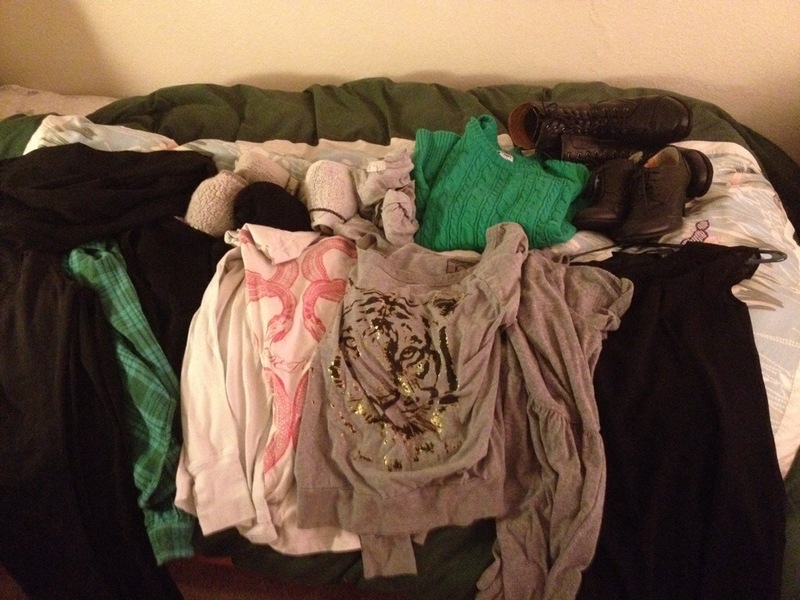 5 days worth of clothing laid out. Remedy the financial and time cost of checking baggage by traveling only with the approved carry on bag! I recently went on a trip from San Jose, California to East Hampton, New York for five days. I was able to fit all of my items into a purse and a soft sided carry on bag, which together fit perfectly under the seat in front of me. You can easily do this, too! Here is my technique for making this possible. Figure out what the bulkiest clothing items are and wear them on the plane/train/boat/etc. In this case, I wore my winter coat, a sweater, a long sleeved shirt, pants, thick socks, boots, and a scarf. This will save you a massive amount of room in your bag. I wasn’t uncomfortable and actually used the jacket as a blanket on the plane since some airlines no longer give those out. This also meant I was prepared when I got off the plane to take the train since New York is much colder than California. Utilize minimalist packing tricks, such as planning out your outfits beforehand and making each piece work in multiple outfits to maximize their usage. Once you have all items laid out, stuff small things like socks and underwear into your shoes. Shoes are the usually the heaviest item and will provide some structure, so place them at the bottom of your bag. If you have anything you don’t want to get smashed (gifts, etc.) then putting those inside shoes can help protect them. Cords and chargers can also fit inside shoes. Next, tightly roll larger clothing items such as shirts and pants. This hack makes them take up less room and be easier to stack inside your bag. 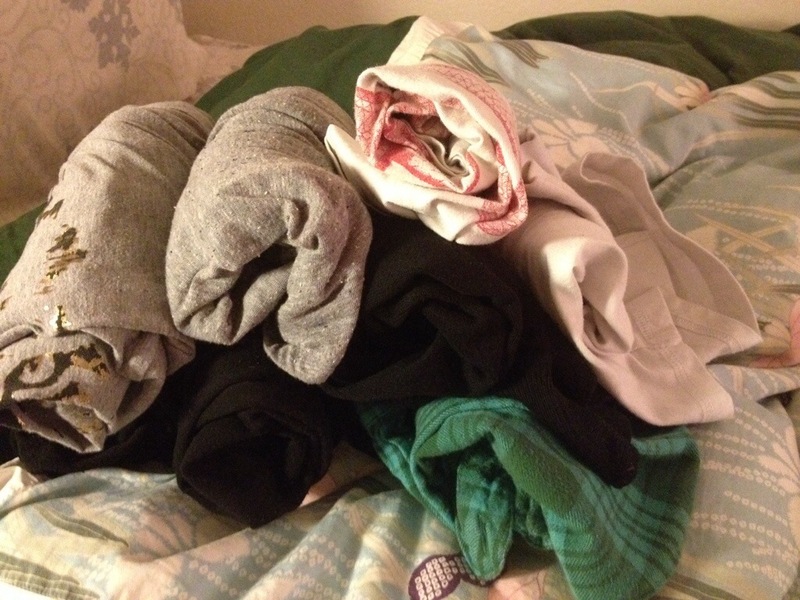 Clothing rolled up to save space. Fill all crevices and open spots with small items like chargers, socks, underwear, etc. Be sure to have items you will need to take out during your trip, such as liquids to go through security or a book to read or snacks, located near the top of your bag for easy access. I have used these guidelines time and again when packing for a trip and have been able to survive for over a week with just the items I could fit in a carry on bag. Following these tips, you can do the same! Share your packing tricks with me on Twitter or by commenting below, I’d love to hear them!